A single grower can’t grow all kinds of flower bulbs in his fields. This is why wholesale and export companies buy their flower bulbs from various growers. They can then offer their buyers many kinds of flower bulbs. Many flower bulbs are usually packed into large boxes and crates. In a shop, you often see them packaged in nets and small boxes with pretty pictures on them. The pictures give customers an idea of what to expect when the bulbs bloom. Flower bulbs have to be treated with care. ‘Handle flower bulbs as if they were eggs’ say people in the flower bulb business. This is because a flower bulb can be damaged. But a diseased bulb should never be found among all the healthy ones. The flower bulbs being exported to other countries have to pass very strict inspections. If they pass, they get a plant passport. If not, they can’t cross the border. The flower bulbs also have to remain in good condition during shipment. 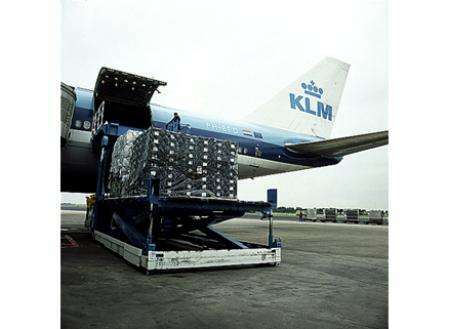 Lorries, aeroplanes and ships take them all over the world. These modes of transport are designed and equipped to make sure that the flower bulbs are healthy when they arrive at the customer’s location. Where do the flower bulbs go next? Which classes are in the newspaper? Flower bulb of the week: the daffodil.